The positive pad behaves like ice, causing reduced circulation to the area under the pad and reduction in swelling. The negative pad behaves like heat,causing increased circulation, reportedly speeding healing. 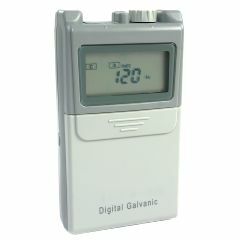 Digital Galvanic Stimulation is most useful in acute injuries associated with major tissue trauma with bleeding or swelling. In contrast to TENS or IFC units, which apply alternating current,Galvanic Stimulators apply direct current. Direct current creates an electrical field over the treated area that, theoretically,changes blood flow and moves fluids. The positive pad behaves like ice, causing reduced circulation to the area under the pad and reduction in swelling. The negative pad behaves like heat,causing increased circulation, reportedly speeding healing. Includes: Device, batteries, lead wires, electrodes (3 packs of 4), carrying case and users manual. 1 pair of lead wires. Includes: 1 pack of four active electrodes and 1 ground electrode. Industrial strength heavy duty 9V battery. This PGS 123 Digital HVPC Device has: 1) Polarity Reversion switch and 2) Ramp-in Ramp-Out Specs, as other similar HVPC devices.